Hello. My name is Jovon and I have been picking my grandmother's brain for ages trying to get her to think back to her mother whom is from the rocky mount area possibly. She says she doesnt remember much because she was the youngest of many but my grandmother is a Hawkins (paternal) and a Lucas (Maternal) can anyone help me find my past? Thank you for visiting NCpedia and taking time to share your interest and question. We would be glad to try to help you. By email, I'm connecting you with Reference Services at the N.C. Government & Heritage Library. A librarian will contact you shortly to help suggest ways you can go about researching your past and family history. I’m also including a link to a free online learning resource at the Government & Heritage Library. It’s called “RootsMOOC” -- http://statelibrary.ncdcr.gov/ghl/resources/rootsMOOC.html. It’s a short online tutorial on how to go about doing family history research. There are four “modules” and they are all self-paced. You can access the video and tutorials online at that link and watch them at your leisure. Hello. 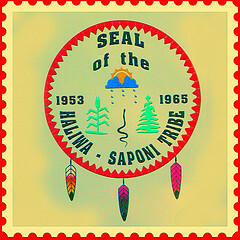 I was always told I had ties within the Haliwa-Saponi tribe through my mother's side. She is in the Hart family and they reside in Rocky Mount NC. I would love to know if they have had ties to the tribe because I would love to learn more about my heritage. I am also replying to the email address you included with your post and cc’ing Reference Services at the NC Government & Heritage Library. A librarian will contact you shortly to suggest resources for researching Haliwa-Saponi heritage in North Carolina. I was trying to find out info on my other family heritag. Grandfather was a saponey and grandmother was Haliwa . Could you help me ? My family heritage is also Haliwa Saponi. I'd be happy to share the information and genealogy I have of the CH Richardson Family. Well K Richardson...I don't want to try to guess which cousin of mine this is but since Rev. Charlie Horace Richardson was my great-grandfather too, I have sneaky feeling that I already know:-). All that being said, I would love to reach out and meet my blood relatives. My grandparents are deceased now and my father is also. He has one sister living who is familiar with the blood line but she is not too familiar with anyone past her generation.... (age 65).